This charming bed and breakfast sits in Oppède-le-Vieux, one of the oldest perched villages of the Luberon Massif. It offers spacious en suite rooms and breakfast on the interior courtyard. Belle de Nuit’s restaurant provides homemade dinners, prepared with fresh seasonal product from the market. The bed and breakfast also provides a wine list featuring local wines. Each room is individually decorated in a rustic style and has free Wi-Fi.The private bathrooms feature a shower. Belle de nuit bed and breakfast also offers free internet access in public areas and bicycle rental. It is 4.5 km from Menerbes and 36 km from Avignon. Local activities include cycling and hiking. Located in Les Lônes, Le Mas des Lônes is a 17th-century Provencal country house and features an outdoor swimming pool and furnished terrace. 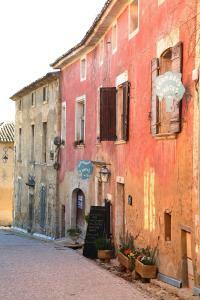 Set in the Luberon Regional Nature Park, it is just 2 km from Oppède. All of the rooms at Le Mas des Lônes are uniquely decorated in a typical, Provencal style. Each room comes with a private bathroom, which is equipped with a shower or bath, free toiletries and a hairdryer. A continental breakfast can be served each morning in the dining room. It consists of homemade jams produced with locally grown fruit, pastries and fresh bread. A summer kitchen including a dining area and is available for guest use. Shops and a grocery can be found 2 km away. Guests have access to a shared TV lounge with tea and coffee making facilities. Free Wi-Fi access is available throughout at Le Mas des Lônes. Free private parking is also possible on site and Avignon is 38 km from the B&B. Just 10 km from Cavaillon in the heart of vineyards, Demeure d'hôtes et Mas Maurice features self-catering accommodation with a garden, a terrace with sun loungers and outdoor swimming pool. Free private parking is provided. The air-conditioned houses feature a private entrance, a living room with TV and DVD player, a bathroom with hairdryer and bathtub or shower. A washing machine is also available. Guests have access to an open plan kitchen with microwave, oven and stove to prepare their meals. BBQ facilities are also provided. Restaurants and shops can be found 1.5 km away. There are hiking, cycling or horse riding facilities in the area. L’Isle-sur-la-Sorgue is just 13.9 km away, or guests can drive 34.7 km to visit Avignon. Avignon TGV Train Station is 35.1 km away. Featuring an outdoor swimming pool heated all year long, Le Jardin d'Ivana is a B&B featuring a flowery garden with a shaded terrace. A 15-minute drive from the motorway exit, the property is in the Lubéron countryside, between Cavaillon and Apt, a 40-minute drive from Avignon TGV station. Individually decorated rooms have private bathrooms, some of which feature a spa bath and a multi-jet shower and free WiFi. Some rooms also have a private terrace or balcony and they all have mosquito preventive windows. Breakfast is serving every morning, which includes eggs, cheese, bread, butter, homemade jams, seasonal fruit, dairy products and pastries. Traditional Provençal meals featuring local produce can be prepared upon request on an evening. Guests can go hiking or cycling in the area, on the Vaucluse and Ventoux mountains. There is also a small outdoor fitness area available at the property, and the surrounding lavender fields and vineyards can be enjoyed during summer. 2 electric bicycles can be rented on site. L'Isle-sur-la-Sorgue, Fontaine-de-Vaucluse, Gordes, Roussillon and Lacoste are all less than a 20-minute drive from the property. Marseille and its' airport is less than a 60-minute drive away. Featuring a shared pool, Les Bastidons du Souleyan is located in Oppède. Set in a garden, it offers self-catered accommodation with private terrace. Free Wi-Fi is available throughout. Facilities include a mini golf and table tennis. All 2-bedroom houses at Souleyan come with a flat-screen TV. Each has a kitchen with stove and dining table. Ironing facilities are included. Guests may relax at the sun loungers of the sun terrace by the pool or use the BBQ facilities. Various activities, including mini golf and table tennis, can be enjoyed at the property. A bakery is 1.5 km away and a supermarket for the general supplies is 3 km away. Gordes is at a distance of 6 km and Fontaine de Vaucluse is 10 km away. Avignon Train Station is 35 km away. Free private parking is possible on site. Located in Oppede of Provence, the stone-built B&B Les Bouisserettes features a swimming pool and a furnished sun terrace amidst its blossomed gardens. It has a shared outdoor kitchen, a lounge area with flat-screen TV and DVD player, and offers free Wi-Fi access throughout. Fitted with tiled floors and wrought-iron or wooden furnishings, all rooms of Bouisserettes enjoy views over the garden or the swimming pool. Each is equipped with a wardrobe and includes a private bathroom with shower. Some units open to a balcony. A continental breakfast including homemade jams is served daily at the furnished terrace or at the dining area. Guests can also use the outdoor kitchen which includes fridge, stone-built oven and BBQ facilities, and enjoy al fresco dining. A table tennis and a children's playground are featured on site. Guests can also play badminton and pétanque or just relax at the sun loungers by the pool. A small library can be found at the common lounge area. The centre of Oppede, where restaurants are featured, is 2 km away, while supermarkets can be found within 6 km from the property. Gordes is 15 km away and the scenic Avignon is at a distance of 30 km. Marseille Provence Airport is 80 km away. Free on-site parking is possible. 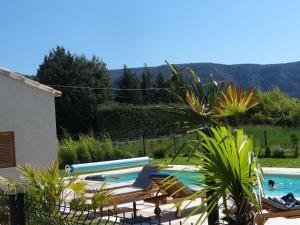 Offering an outdoor pool and garden, Souleia offers self-catering accommodation located in Oppède. Free WiFi access is available. Featuring views of the Luberon valley, the accommodation will provide you with a TV and a terrace. There is a fully equipped kitchen with a dishwasher and a microwave. The private bathroom has a shower. An array of activities can be enjoyed on site or in the surroundings, including cycling and hiking. 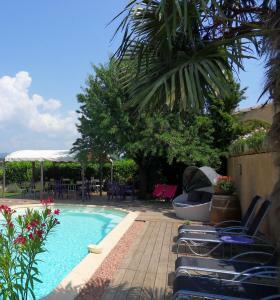 This holiday home is 46 km from Marseille Provence Airport. The property offers free parking. Holiday Home Le Bastidon Oppede is a renovated stone house situated on the outskirts of the town. It is situated in grounds of 1700 m2, partly shaded. The house provides a TV, dishwasher, washing machine and a fireplace. There is a private swimming pool (above ground) (6 x 4 m, depth 135 cm, 15.04.-15.10.). Parking is possible in the ground and please note that a car is necessary. Shop and grocers are in 3 km. A pretty Provence house (85 m2). comfortably arranged and very well equipped with a private swimming pool. in a group of houses but each having their own privacy. Its location at the foot of the Lubéron will enable you to enjoy going out for walks in the surrounding countryside and exploring the many picturesque little villages in the region (including Gordes. Bonnieux. Isle sur La Sorgue. Menerbes. Lacoste and Fontaine de Vaucluse). Avignon with its many opportunities for cultural activities is 20 km away. and trips to the sea are possible as it is 70 km away. Located 10 km from Cavaillon, Mas Dansavan Chambres d’hôtes offers an outdoor heated swimming pool, garden and sun terrace. Avignon is a 40-minute drive away. All rooms are air-conditioned and feature a view of the countryside, pool or garden, a flat-screen TV and wardrobe, while the suite also has a terrace. The private bathroom and toilet are separate. A continental breakfast serving tea, coffee and pastries is provided each morning at Mas Dansavan. Guests can also find restaurants within 1.5 km. 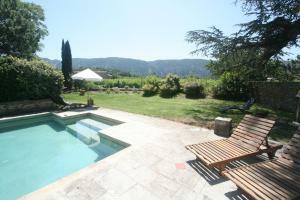 L'Isle-sur-la-Sorgue is a 15-minute drive away and Apt is 22 km from the property. Additional features include table tennis, deckchairs, free Wi-Fi access and free private parking on site. simple-hotel-booking.com offers you a 24/7 free e-mail support.